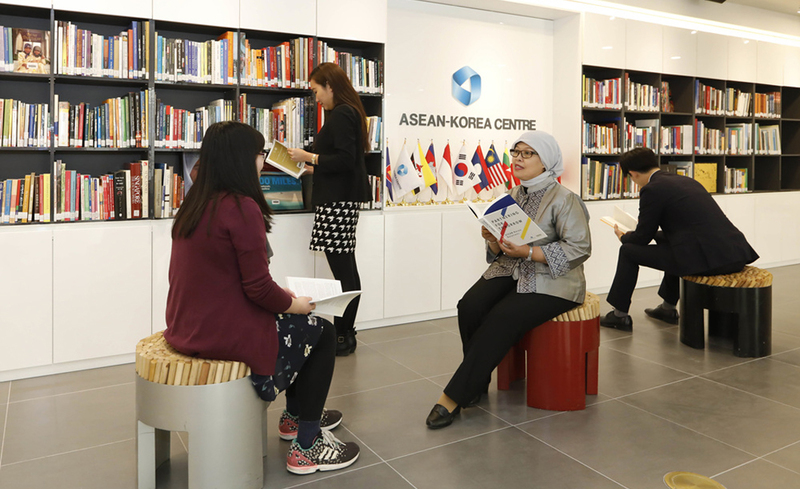 ASEAN-KOREA CENTRE : Centre Activities - ASEAN Hall . 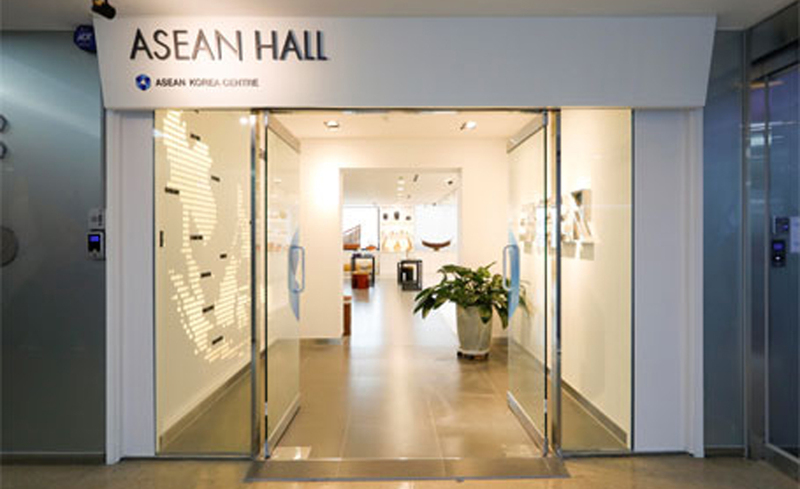 ASEAN Hall is a multi-purpose space utilized for exhibitions, lectures, seminars, and various other events that promote inter-cultural understanding between ASEAN and Korea. The ASEAN Hall exhibits handicrafts, artworks, design items, textiles, and traditional musical instruments of the 10 ASEAN Member States year-round for visitors to see and experience the diverse cultures of ASEAN. Books and multimedia resources (movies, music CDs, etc.) 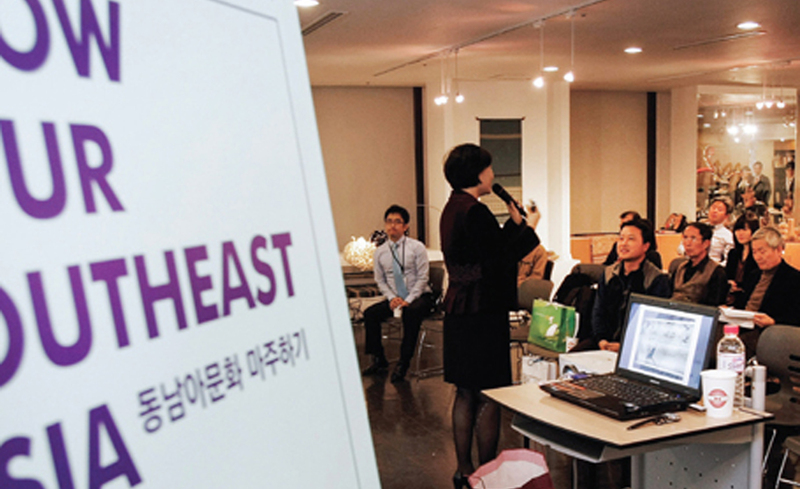 on ASEAN Member States, ASEAN-Korea relations, and activities of the ASEAN-Korea Centre, are accessible to the public. The ASEAN Hall provides a visit program for youths in which participants have the opportunity to learn about ASEAN, ASEAN-Korea relations, and the ASEAN-Korea Centre. The visit program offers the students and visitors a brief introduction about ASEAN and the Centre as well as variety of activities including experience traditional musical instruments and exhibition items of ASEAN, Quiz session, and Q&A time. The program runs approximately 60-90min depending upon request. The ASEAN Hall of the ASEAN-Korea Centre (AKC) is a multi-purpose space to promote and enhance economic and socio-cultural cooperation between ASEAN Member States and Korea. Strategically located in the center of Seoul on the 8th floor of the Press Center Building, the ASEAN Hall is open to be utilized as a space for ASEAN-related business affairs, such as seminars, workshops, business meetings and/or promotional events. The ASEAN Hall is approximately 200 square meters in size, with a maximum seating capacity of a 100 people. It is also equipped with a projector, display screen and a basic sound system. In addition, visitors to the ASEAN Hall can access the Information Corner that provides various books and periodical publications on ASEAN Member States and ASEAN-Korea relations. The operational hours of the Hall are regular office hours from 09:30 a.m. to 5:30 p.m., with no extra charge incurred for utilizing the hall space. However, do note that if the Hall is to be utilized during weekend or non-working hours, there will be an additional charge according to the AKC Guidelines for Utilization of the ASEAN Hall by other entities. Utilization of the ASEAN Hall is intended for public or private entities but not for individuals. ASEAN Embassies, diplomatic corps, public institutions, schools, universities, academia, business circles, enterprises, etc. are free to apply for the use of the Hall. Closed on weekends (Sat·Sun) and National Holidays. Closing days are subject to change depending on special occasions and notices will be posted on the website in advance.